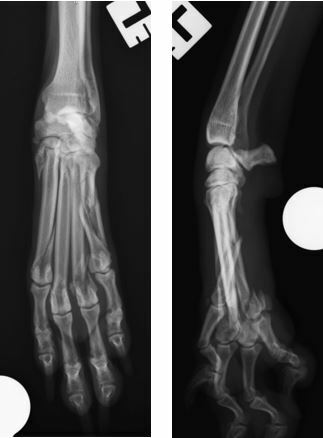 Metacarpal and metatarsal fractures are common traumatic injuries in dogs and cats. We are frequently asked whether these fractures should be treated by coaptation or whether they should be surgically repaired. Minimally displaced fractures of the shaft of one or even two metabones will usually heal satisfactorily following coaptation as a result of the splinting effect of the remaining bones. Surgery is indicated for displaced fractures and if more than two metabones are fractured particularly if the middle two weight-bearing metabones (III and IV) are involved. Indications for surgery include cats which tolerate coaptation poorly, large breed and/or athletic dogs and patients with multiple orthopaedic injuries. Other indications for surgical management include fractures of the base (proximal end) of the second and fifth metabones as these are points of ligamentous insertion involved in joint stability, and fractures of the head (distal end) if the fragments are sufficiently large as these may compromise metacarpophalangeal/metatarsophalangeal joint function. A number of methods of surgical repair have been described including intramedullary pinning, bone plating, lag screws and external skeletal fixation including the secured proximal intramedullary dorsal epoxy resin (SPIDER) frame. The choice of fixation will be based on a number of factors including the configuration of the fracture, the size of the patient and the presence of soft tissue injuries. 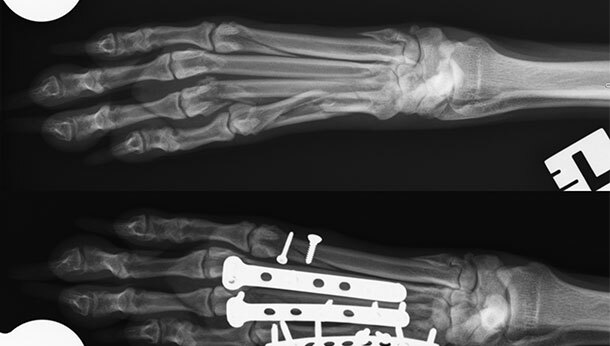 This case report describes the treatment of a dog with multiple metacarpal fractures that were treated with the use of bone plates and lag screws. Pearl a 10 year old crossbreed whippet was presented for fracture of all four left metacarpals following trauma (a fall whilst running). Radiographs revealed an oblique fracture of metacarpal (MC) II, distal comminuted fractures of MCs III and IV and a segmental fracture of MC IV. On presentation Pearl was bright and alert. Gait examination revealed severe left forelimb lameness. The remainder of the general physical examination was unremarkable. Regional anaesthesia was performed prior to surgery using a RUMM (radial, ulnar, median and musculocutaneous) block. 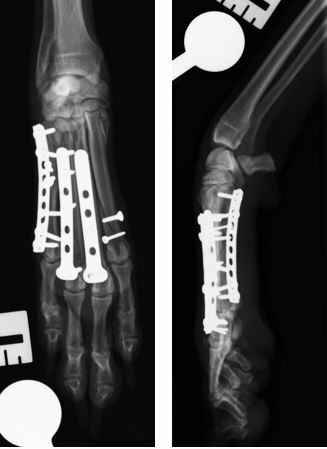 The fractures were repaired using open reduction and internal fixation. MC II was repaired with two lag screws. MC III was repaired with a dorsal 1.5/2.0 mm 8-hole ‘T’ plates with two 1.5mm screws distally and three 2.0mm screws proximally. MC IV was repaired with a dorsal 1.5/2.0mm 8-hole ‘T’ plates with two 2.0mm screws distally and three 2.0mm screws proximally. MC V was repaired with two 1.5mm lag screws and a lateral 2.0mm 9-hole dynamic compression plate with two screws proximally and distally. Closure was performed routinely with non-absorbable skin sutures and Dermabond adhesive. Post-operative radiographs revealed satisfactory implant positioning and alignment. If you would like to know more about our Orthopaedic service, please click here.